The Holdsworth Center recently announced the selection of 14 school districts as finalists for the second cohort of Holdsworth's 5-year program focused upon building a strong talent pipeline and leadership development system within each district. 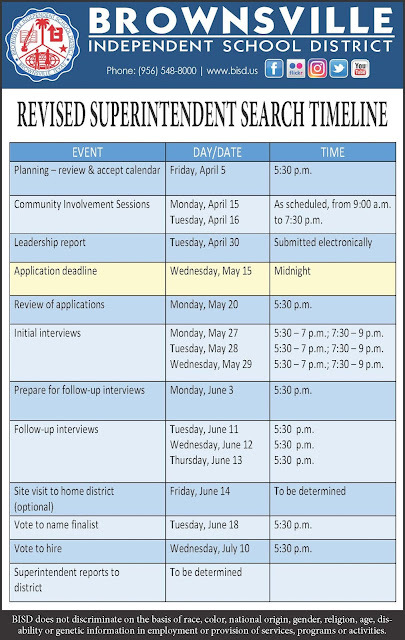 Holdsworth staff will conduct site visits to each district in early 2019 and will announce the six districts selected to be part of the next cohort in April 2019. The 14 districts are: Abilene ISD, Aldine ISD (Houston area), Brazosport ISD (Gulf Coast), Brownsville ISD, Harlingen ISD, Judson ISD (San Antonio), Lockhart ISD, Mesquite ISD (Dallas-Fort Worth area), Midland ISD, North East ISD (San Antonio), San Angelo ISD, San Antonio ISD, Spring ISD (Houston area) and Waco ISD. The Holdsworth Center staff applauded every district who applied to be part of the program for their level of leadership and innovation that continues to direct their classroom achievements. Schneider Electric, an energy service company, was contracted by the BISD to address the lighting, air-conditioning, and related issues at the following schools: Porter ECHS, Besteiro MS, Garcia MS, Lucio MS, Aiken ES, Paredes ES, Southmost ES, and the Aquatic Center. The improvements are part of the district’s commitment to being an innovative, proactive, green district and making facilities safer and overall more conducive to learning. 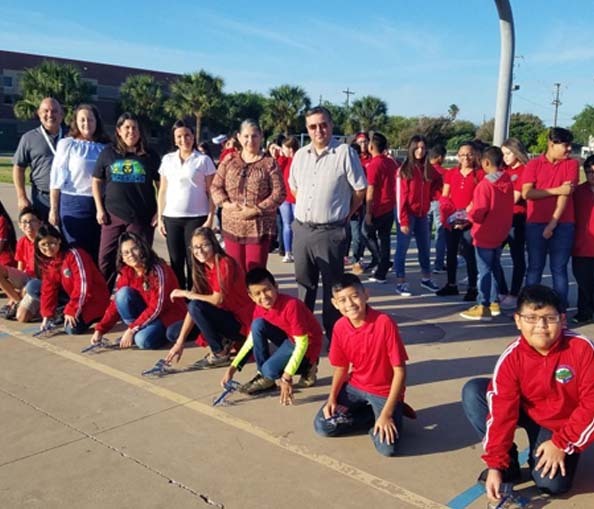 As Schneider Electric proceeds with these projects the company also makes an effort to collaborate with the district through its many student engagement initiatives. The first of these initiatives was a tree-planting project carried out at Castañeda Elementary. The second took place during the month of October which was Energy Awareness Month. Company representatives met with district and campus personnel at Garcia Middle School to conduct a Solar Car Race. On the first day of the STEM-based learning activity Schneider Electric employees provided an introductory lesson to sixth grade students about renewable energy and its benefits. They then distributed solar car kits to teams of students so they could build their solar cars. On the second day the sixth grade teams went outside and with the help of a sunny morning competed against one another to determine which solar car would go the farthest. A reflective discussion was held after the racing to review and summarize what the students had learned from their activity. The Garcia Middle School administration and sixth grade teachers were especially grateful to Schneider Electric for not only providing all of the materials for the event but guiding the instruction as well. The company has already made plans for additional collaboration with BISD through Science Fairs that will take place in December and January. View the event photos and videos. View the event photos. 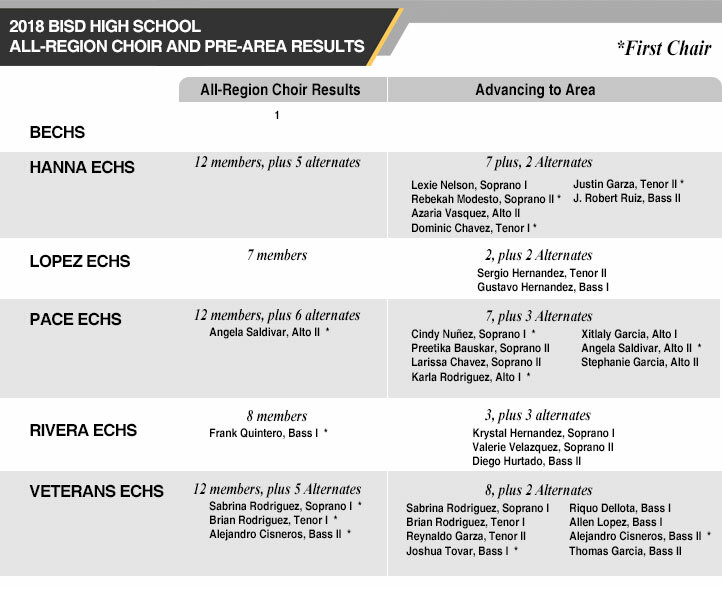 The TMEA HS All-Region Choir and Pre-Area auditions for Region 28 (including Los Fresnos, San Benito, Harlingen, Weslaco, and Donna) were held this past weekend and we are happy to share these results! After the All-District Choir auditions, 20 vocalists for each section auditioned for the second round and the top ten students were selected for the All-Region Choir. In this round, BISD earned 53 out of 80 available chairs. Then, in the afternoon, these students advanced to Pre-Area, where they had to perform prepared music and sight-read to determine who would advance to Area auditions in January. We are proud to announce there are 27 BISD choir members going to Area auditions, where they have one shot to be selected for a coveted spot in the All-State Choirs! Also, in the Pre-Area round, BISD schools earned ALL 8 FIRST CHAIRS! The TMEA Region 28 High School All-District and All-Region Choirs will perform at the Harlingen CISD Performing Arts Center Friday, November 9th at 6:00 p.m.
Congratulations to all students, MS feeders, and HS directors! BISD band members recently competed for a spot in the TMEA Region 28 All-Region Orchestra and produced outstanding results! The available wind and percussion chairs are quite limited as the orchestra is primarily composed of string players. Having BISD band members earn 20 out of 29 available wind/percussion chairs proves they are not only fantastic musicians, but are truly the best of the best! 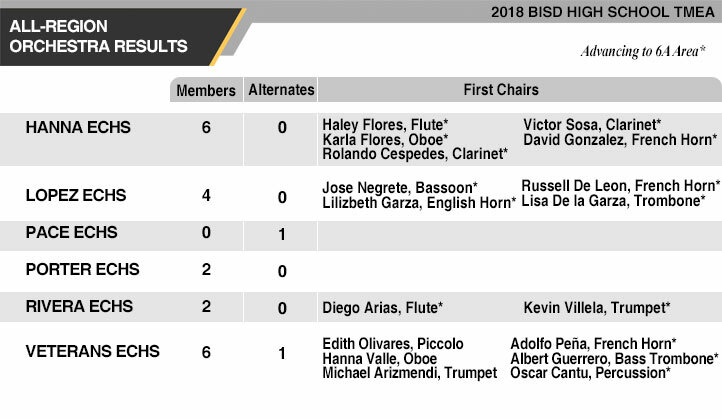 There are 11 available first chairs (for wind/percussion) and BISD earned ten of them! Also, we have a record for our district AND for Region 28 … Veterans Memorial earned a record total of SIX first chairs!!! The TMEA Region 28 High School Orchestra will perform at the Weslaco ISD Performing Arts Center on Saturday, November 10th, at 5:30 p.m. Fantastic job, everyone! On Wednesday, September 19th, Region 28 held the annual audition for the TMEA Region 28 High School Jazz Band. High schools across the valley brought 110 students who competed for one of only 39 available chairs. We are proud to announce that BISD band students earned a record total of nine chairs! 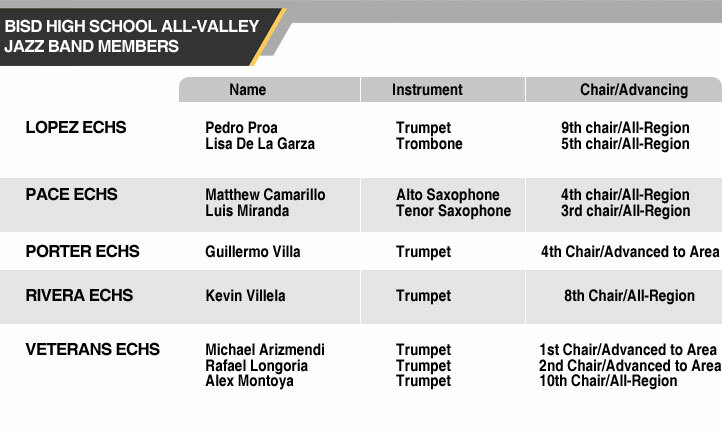 One BISD band student earned first chair, and three of the nine students advanced to the area round of competition for a chance to be selected for the TMEA All-State Jazz Band. The TMEA Region 28 High School All-Region Jazz Band will perform on Saturday, February 9, 2019, at the Harlingen Performing Arts Center at 4:00 p.m.
Choir Members make BISD shine at All-District Treble Choir auditions. On Saturday, October 27, 2018, high school choir students from Region 28 held auditions for the Texas Music Educators Association All-District Treble Choir and BISD choirs took a majority of the available chairs – 51/80! We are so proud of all the students who challenged themselves, some of whom auditioned for the first time! The TMEA Region 28 High School All-District Treble Choir will perform in a concert on November 9, 2018, at the Harlingen Performing Arts Center at 6:00 p.m.
We continue to celebrate the efforts and successes of these students and directors! 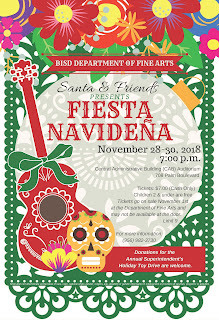 BISD Fine Arts: Santa & Friends, Tickets on sale now. 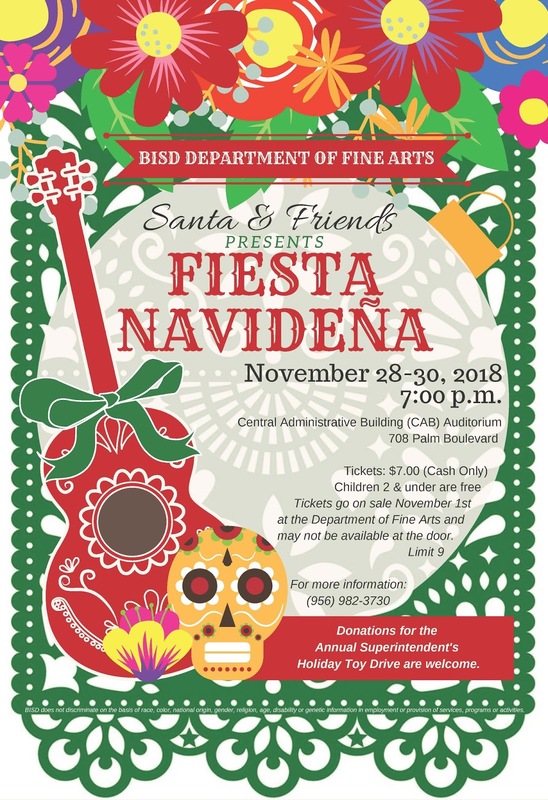 Children 2 & under are free Tickets go on sale November 1st at the Department of Fine Arts and may not be available at the door.